Map of Roman remains within the modern Carthage municipality. After the destruction of Punic Carthage in 146 BC, a new city of Carthage (Latin Carthāgō) was built on the same land. By the 3rd century, Carthage developed into one of the largest cities of the Roman Empire, with a population of several hundred thousand. It was the center of the Roman province of Africa, which was a major breadbasket of the empire. Carthage briefly became the capital of a usurper, Domitius Alexander, in 308–311. Conquered by the Vandals in 439, Carthage served as the capital of the Vandal Kingdom for a century. Re-conquered into the Byzantine Empire in 533/4, it continued to serve as a Roman (Byzantine) regional center, as the seat of the praetorian prefecture of Africa (after 590 the Exarchate of Carthage) until it was finally destroyed in the Muslim conquest of the Maghreb in 698. By 120 - 130 BC, Gaius Gracchus founded a short-lived colony, called Colonia Iunonia, after the Latin name for the Punic goddess Tanit, Iuno Caelestis. The purpose was to obtain arable lands for impoverished farmers. The Senate abolished the colony some time later to undermine Gracchus' power. 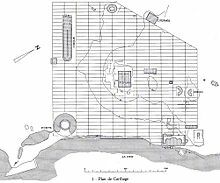 After this ill-fated attempt, a new city of Carthage was built on the same land by Julius Caesar in the period from 49 to 44 BC, and by the first century, it had grown to be the fourth largest city of the empire, with a population in excess of 100,000 people. It was the center of the province of Africa, which was a major breadbasket of the Empire. Among its major monuments was an amphitheater, built in the 1st century, with a capacity of 30,000 seats. Carthage also became a center of early Christianity. Tertullian rhetorically addressed the Roman governor with the fact that the Christians of Carthage that just yesterday were few in number, now "have filled every place among you —cities, islands, fortresses, towns, market-places, the very camp, tribes, companies, palaces, senate, forum; we have left nothing to you but the temples of your gods." (Apologeticus written at Carthage, c. 197). In the first of a string of rather poorly reported Councils at Carthage a few years later, no fewer than 70 bishops attended. Tertullian later broke with the mainstream that was represented more and more by the bishop of Rome, but a more serious rift among Christians was the Donatist controversy, which Augustine of Hippo spent much time and parchment arguing against. In 397 at the Council of Carthage, the Biblical canon for the western Church was confirmed. The Vandals under their king Genseric crossed to Africa in 429, either as a request of Bonifacius, a Roman general and the governor of the Diocese of Africa, or as migrants in search of safety. They subsequently fought against the Roman forces there and by 435 had defeated the Roman forces in Africa and established the Vandal Kingdom. Genseric was considered a heretic, too, an Arian, and though Arians commonly despised Catholic Christians, a mere promise of toleration might have caused the city's population to accept him. After a failed attempt to recapture the city in the 5th century, the Byzantines finally subdued the Vandals in the Vandalic War of 533–534. Using Gaiseric's grandson's deposal by a distant cousin, Gelimer, as either a valid justification or pretext, the Byzantines dispatched an army to conquer the Vandal kingdom. On Sunday, October 15, 533, the Byzantine general Belisarius, accompanied by his wife Antonina, made his formal entry into Carthage, sparing it a sack and a massacre. Thereafter, the city became the seat of the praetorian prefecture of Africa, which was made into an exarchate during the emperor Maurice's reign, as was Ravenna on the Italian Peninsula. These two exarchates were the western bulwarks of the Roman Empire, all that remained of its power in the West. In the early seventh century, the exarch of Carthage overthrew the Roman emperor, Phocas. The Exarchate of Carthage was first assaulted by the Muslim expansion initiated from Egypt in 647, without lasting effect. A more protracted campaign lasted from 670 to 683. In 698, the Exarchate of Africa was finally overrun by Hassan Ibn al Numan and a force of 40,000 men. Carthage was destroyed and its population was displaced to the neighboring medina of Tunis, which became the major regional center. Carthage's materials were used to supply the expansion of Tunis. The destruction of the Exarchate of Africa marked a permanent end to the Byzantine Empire's influence in the region. This page was last edited on 9 February 2019, at 14:09 (UTC).